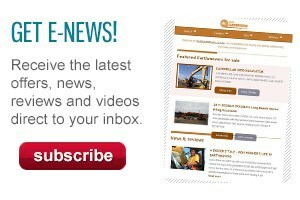 The massive new 1,000-tonne Liebherr LR 11000 crawler crane has been used for the first time as part of the modernisation of the Petrom refinery in Plojesti, near the Romanian capital Bucharest. 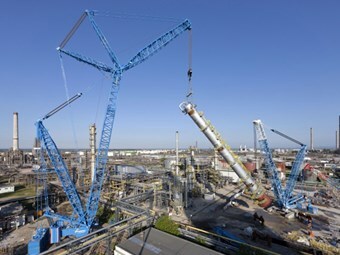 The Liebherr LR 11000 crawler crane lifts a column at the Romanian refinery. An LR 1750 model was used for control at the foot of the column. In this operation several columns had to be hoisted into the existing system, with the largest of the massive steel cylinders measuring 58m in length and 4m in diameter, and weighing in at 335 tonnes. The weight of the column was no problem for the LR 11000, which has a maximum lifting capacity of 1,000 tonnes at 11 m.
Instead, what made the job tricky for the specialists from Austrian heavy load contractor Felbermayr was having to carry out the work with the plant running and in extremely constricted conditions. Existing plant parts drastically reduced the usage radius of the LR 11000, with pipe bridges and tanks making life particularly difficult for crane driver Stephan Kraus and his team. A working area of just around 35 square metres was available for the crane. The erection of the lattice boom and luffing jib also proved to be very difficult as a narrow alley just 5m wide had to suffice.